Being a firefighter or EMT can be an extremely stressful job, especially when lives are at stake. Two way radios improve communication and safety. Improved communication as well as the confidence that, with two way radios, additional help, if needed, will be on the way should something go wrong allows fire and rescue workers to focus on the job at hand. Communicating about where to go and what needs to be done is never more critical than when physical danger is present and when what could happen next is unpredictable. Intrinsically safe and other heavy duty two way radios are available to assist you in safely assessing and handling any situation. You can rely on Motorola two way radios to back you up when you need quick communication that is dependable with loud audio quality and long-lasting batteries. Reliable communication and quick emergency response time are crucial for firefighters and emergency responders. 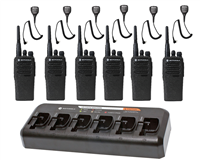 That is why you will find Motorola two way radios on this page - with plenty of power and a two-year warranty, these two way radios will get the job done. The Motorola CP200d is the best two way radio for emergency situations. With superior build, speaker quality, and range, it is no surprise that the Motorola CP200d is the best-selling two way radio in the world. The CP200d also allows for both analog and digital communication, so you can transition to digital at your own pace. The Motorola RDU4100 offers four-watts of power and an unbeatable 18.5-hour battery. The RDV5100 is a VHF alternative. Both will work with the HKLN4606 speaker mic.